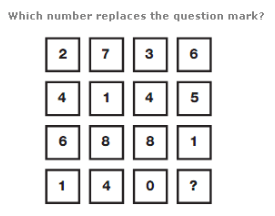 The following number puzzle questions aim to strenghten you reasoning skills by making you find the missing number and the hidden sequence. 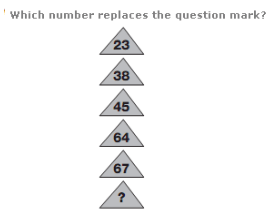 The numbers are not just random, they give you clues how to find the missing number. As you move down, the numbers represent multiples of 12, subtracting 1, for the first step, adding 2 for the second, subtracting 3 for the third, adding 4 for the next etc. etc. 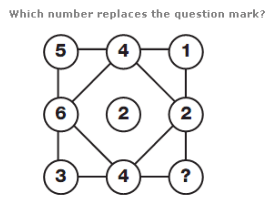 Reading each horizontal line as a 4 digit number, add together the top two rows to give the result in the third row, and subtract the first row number from the second to give the result in the fourth row. In each row, the sum of the digits is 10. Each number represents the numerical value of the vowels in the alphabet. 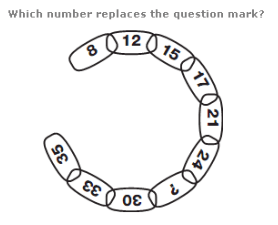 Moving clockwise around the chain, numbers increase by 4, then 3, then 2, before repeating this pattern.